As Contests have their own type, you will have to improve your Pokémon's stats to focus on the type of contest you want. This is done by using PokéBlocks. PokéBlocks are a special type of Pokémon food, created from the berries, that will boost your Pokémon's stat in a specific type. The higher the stat, the better. To create PokéBlocks, you need to access the PokéBlock Kit and select 3 or 4 berries. From this, it will start creating PokéBlocks. This process is entirely automated this time. 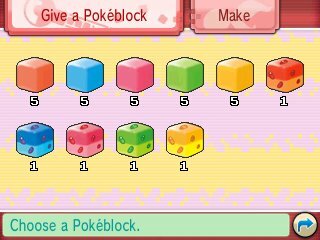 Each of these PokéBlocks will increase a Pokémon's stat and the colour is dependant upon the Berries you provide. Creating PokéBlocks is quite simple in these games. At any time, you can access the PokéBlock Kit key item. This will allow you to feed PokéBlocks you have already created to your Pokémon, or to create your own. When you select create, you have to select from two to four different berries and put them in the blender. 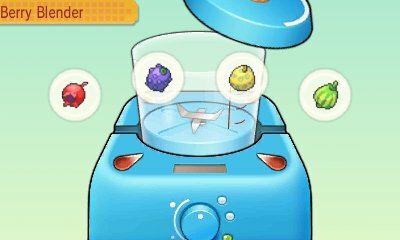 This will automatically create the PokéBlocks and you'll be given four of the specific kind based on the berries. This is done based upon the colour of the berry. Each berry has got a chance of getting you a PokéBlock +. This is chosen at random based on the berries you use. Our Berry List provides details on the likelihood for each berry used. When you give a Pokémon a PokéBlock, before you give it you will see the boost that it will have on each of the stats using a chart on the top screen. This allows you to guage whether or not you wish to give the Pokémon that PokéBlock. Once you feed it, that stat will go up and cannot be lowered. 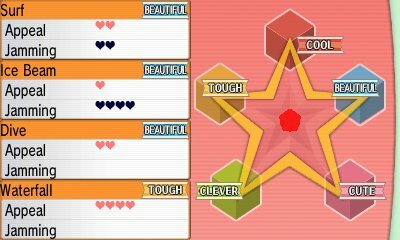 In this game, there are no limits to the amount of PokéBlocks you can give your Pokémon, so if you wish, you can max each stat of the Pokémon.